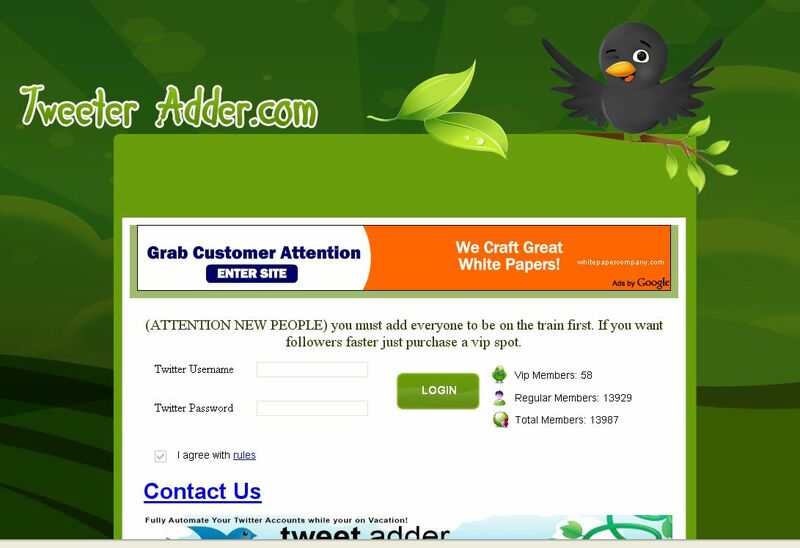 This entry was posted in Twitter and tagged search, SEO, Twitter, twitter search, visibility. Bookmark the permalink. http://addicted-to-squidoo.blogspot.com/2009/06/i-am-having-problems-with-my.html I am adding this link to the comments on the blog. You are so welcome! You have really captured the feeling of not showing up in search! Great post – everyone should check it out so you know you’re not alone! I followed your advice and got it fixed about 20 minutes ago! I am soooooooooo HAPPY! I am sharing this link to your article with everybody! it was really causing me a lot of stress. My new follower numbers had dwindled down to about zero every day as a result of not being listed in a search or showing up on trending topics/searches. I am so thankful for this article. Here is my twitter account I would love for the follow & any new followers since I lost out on so many from this problem. Yes! 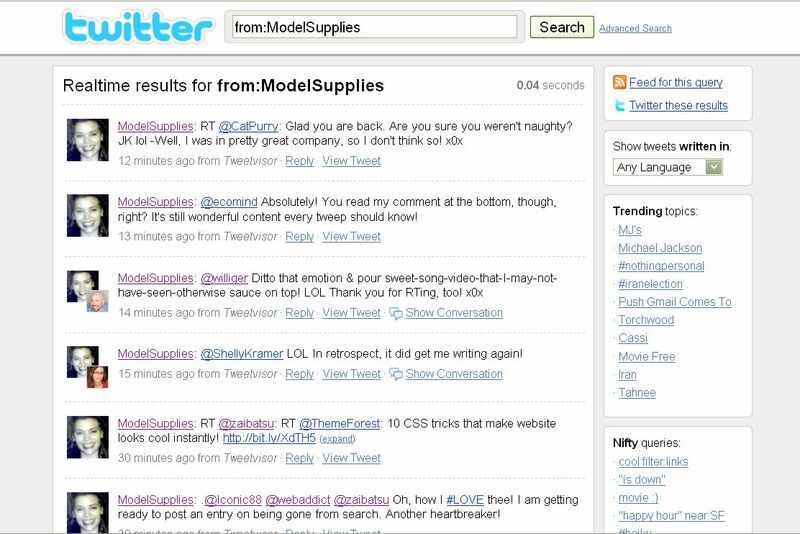 Calvin told me that EVERYTHING-even Google-now uses Twitter search for indexing their sites! My sales were plummeting at eBay & Etsy – they started to take right back off within a day of showing back in Twitter search! Twitter People Search takes a few days longer to resolve, but the 1st is the most important to everything online! Congratulations! I’m SO HAPPY for you! It was horrible not being in the searches. Almost felt like it didn’t matter what I tweeted – love your article for how it felt & hope everyone reads it! (above in 1st comment by Teddi). This is really helpful. I had this problem from May-end of June. I’m back in Search…but any ideas of when I will be back in Find People? Or what’s up with that? I am not showing up in people find yet either but I do not even care about that right now. 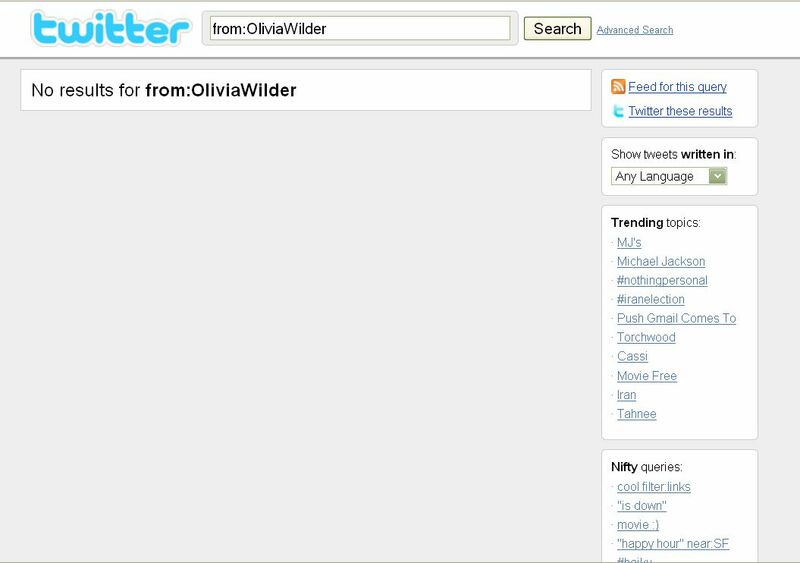 I am just happy my tweets can now be found in trending topics/searches. I got 11 new followers within 12 hours of my tweets showing up in searches again. I am so happy! When you get your ticket number be sure to send a message to the person handling it that “I think I need my cache cleared to fix this problem” That fixed it for me! I hope I NEVER have to go through this again! I am all smiles now!!!!!! Thanks! My problem must be cache-related because I didn’t appear yesterday but I show up today. well, i just realized that i am not showing up in search and none of my tweets are in the public timeline either. what i am beginning to think is that because i used some 3rd party application at myvidoop.com to pull the RSS feed from my primary website and tweet any time i make a post that maybe i got flagged or something? Or because i’m not actually making a physical tweet, but rather just pulling from a feed that its not recognizing my account. if anyone has any ideas or suggestions, i’d love to hear. You’re AWESOME~!! Thank you so much for commenting, Lori~!!! Thanks for this post – it’s the only one that helped me figure out why I had been disappeared from Twitter after researching this issue for weeks! or do I have to start all over with a new account? Doing all of those things will help keep you in search once you are reinstated, but you still have to file a ticket through support to get back in! The great thing is that now you know what to do to avoid falling out again – let’s not forget those programs that force you to tweet – such as “get 400 followers fast!”. I believe that TweetLater/Social Oomph is ok to use, but cannot be certain. Thanks so much for all of your great comments! Thank you Anita for posting this very helpful article. It is SUCH a pleasure to help my very special and wonderful Twitter friends! I have multiple accounts and live Twitter events so this is a HUGE problem for me…HELP! Where on the Twitter Support page is the “Submit a Ticket” link? They seem to have changed it – and I believe Delbius has been promoted… So tweeting to @Charles or @Lukester is what was last recommended, I do believe. Strange – I can’t find where to submit a ticket anymore, either, and I asked! Sorry about that, Robyn! WAIT – This just went through for me: http://twitter.zendesk.com/requests/new Please post and let us know if it works for you, too! Thanks! Twitter is a free service and we receive quite a bit of mail, so we may not get to yours right away. But fret not! 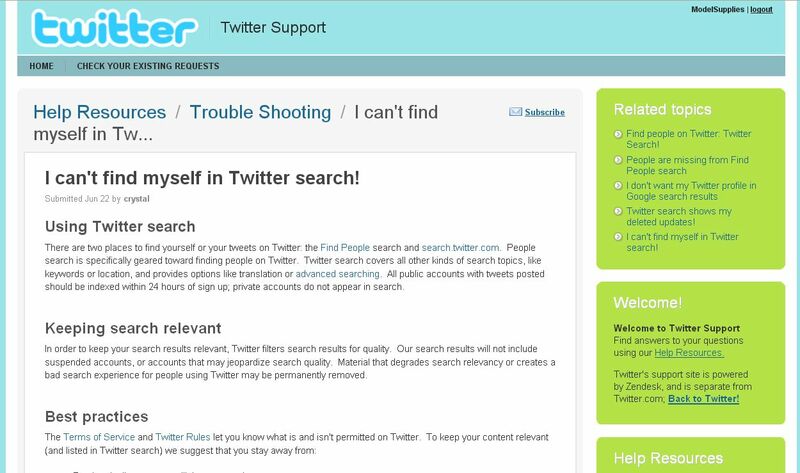 Here are some common issues that may answer any questions you have regarding Twitter search. * My tweets aren’t appearing in Twitter search and I’m not appearing in Find People search. I am proposing to: “grow a group of Twitterers that has enough “juice” to change the rules!!!! I’m Back – and I am back in Twitter Search – thanks for being so patient. How long will it take for twitter to process my request? You should give them 24-48 hours before sending an @ reply to support – try @Charles these days, I think =) @Delbius has been promoted – w00t! Hi friend, I am having this problem, but still it’s not solved, my tweets and hashtatgs are not coming in a twitter search, so help me please . . ! Did you try submitting a ticket at bit.ly/twicket ? Did you try sending your ticket number to @delbius one time without asking for retweets? What is your Twitter name? Thanks for the pointers Anita. I’m only new to Twitter, just a month. But gone totally absent from the searches, tweets and account all missing. For commenting to controversial and biased media Phone-Ins (the reason I signed up!) it means I’m now an unheard voice in the wilderness, and thus utterly pointless tweeting. In my case, from what I’ve read here and elsewhere, I suspect it may have been naïve/enthusiastic use of #hashtags has triggered their aggressive, dumb, dehumanised filtering. So I’m just commenting here to update everyone on their handling, hoping to help other current Googlers/Scrooglers on this topic..
Today, 2011.03.21, my ZenDesk submission, garnered an instant auto-reply email (below), and an instant “Resolved/Closed” status of the Support-Request. D’Oh!. So I’ve had to add a comment to the Support-Request page to re-open it. Whether anything useful results is yet to be seen! 1. Reply to this email to re-open your ticket and let us know, or 2. Follow @support on Twitter and send us a DM (private message). We’ll try to help you in a jiffy! Thanks for being patient, and thanks for using Twitter. Yes~! This post put me on the map. I would recommend following @lukester and/or @Charles and sending him one @reply WITH your ticket number. @delbius is promoted and now the head of a different department (Trust and Safety), while those guys are in Support. @Support is good to follow, but on your ticket, it may actually be assigned to someone. Tweeting the ticket number to them along with a message that you understand the problem, hope they will clear your cache and you will sin no more – usually speeds the process. The ticket number not only assures they get credit for their work, but avoids duplicate requests which no one likes~! tweets are not showing up on my website feed as supposed to. Is there a problem on your end or something I can do? Tweets are not showing up on my website feed as supposed to. Is there a problem on your end or something I can do? This has happened once in the past, and I am not sure if this is a twitter error or something I must do. I believe last time the cache needed to be cleared? Please advise. how long does it take for support to reply?. It’s been two full days now and nothing. This is very frustrating, I was top of the Find People search and now I’m totally gone and I don’t know why. I don’t spam or anything like that. Yes, for some reason it takes a lot longer to get back into the “Find People” search engine than regular Twitter search. I JUST made my account today. and I don’t show up in search at all. Even now that I only have 9tweets. It doesn’t make sense. I did as you mentioned — typed From:Name in the search bar. When I typed my handle >> From:@example, I found it, but when I typed my name From:Name I did not. I did this on some other accounts, and I was able to find it through both the name AND the twitter handle. Does this mean I have been taken out of search? Yes, it most likely does. When you see your name containing the @ symbol, it is like a 3rd party referencing you. You want to see yourself in the 1st person – what you are saying – so if you do not show up without the @ symbol, you will need to follow those steps to get back into search. Thank you, I’ve just been searching for information approximately this topic for a long time and yours is the greatest I have discovered so far. But, what in regards to the conclusion? Are you sure in regards to the source? Yes, at the time of this post, this information was the best. The contacts may have changed over the years. I am having the same problem as described here but i can’t find ”file ticket” anywhere, can you say me where can i find it step by step? Or tell me who should I ask for. This problem is really bothering me. I want to be reachable! It looks like the ability to open a ticket has been diverted to this page – toward the bottom, are issues about tweets you can report. I believe the part about missing tweets will be a dead end.